Desktop sized games aren’t the only thing Palo Alto’s premiere streaming service is pushing to your tablet — now OnLive is out to stream you an actual desktop, as well. Following up on an old Windows 7 demo and later promises to build a “no-compromise, media-rich enterprise experience,” the outlet is now launching OnLive Desktop. 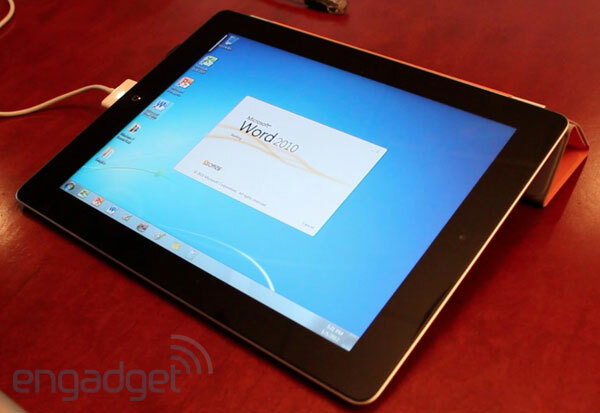 It’s almost exactly what it sounds like — Windows, seamlessly streaming to your iPad. Microsoft’s OS rides the same bandwidth pipelines that host OnLive’s gaming service, and offers tablet owners a streamed desktop with access to fully functional versions of Microsoft Office products like Word, PowerPoint and Excel. The iPad app that is launching Thursday represents the outfit’s “free” version of OnLive Desktop, and packs 2 GB of secure cloud storage in addition its limited suite of office applications. OnLive plans to expand the service with OnLive Desktop Pro, a paid variant (starting at $9.99 a month) with 50 GB of cloud storage, priority server access, additional applications and “cloud-accelerated browsing.” Need something more specific? OnLive Enterprise will let firms custom tailor their cloud desktop to suit their needs — dictating data, application and device access by user. But how well does it work? It depends on your connection, of course. We dropped by OnLive’s west coast headquarters to stream it from the source. Read on to see how it did, or simply skip the bottom if you’re looking for an official press release. OnLive launches desktop app, streams start menus to your iPad, we go hands on (video) originally appeared on Engadget on Mon, 09 Jan 2012 17:35:00 EDT. Please see our terms for use of feeds. The Samsung Series 9 debuted at an odd time, before “Ultrabook” was a buzz word, and when a 2.8-pound laptop was novel enough to warrant a $1,649 price tag. A year later, it returns at an even more pivotal moment: Ultrabooks are cropping up by the dozens, and while their specs are similar to what the original Series 9 had to offer, they cost hundreds less. So with that as the backdrop, Samsung just announced a pair of slimmed-down, redesigned Series 9 laptops: a 13-inch remake, priced at $1,499 and up, and a new 15-inch form number that will cost $1,599-plus when the two go on sale next month. Though consumers are likely to draw comparisons between that 2.5-pound 13-incher and the umpteen other ultraportables hitting the market, Samsung isn’t positioning the Series 9 laptops as Ultrabooks, but rather, premium, top-tier machines. Still, for something that’s not an Ultrabook, the brothers Series 9 certainly look the part: both pack Core i5 processors, 4GB of RAM, 128GB SSDs, six-hour batteries and backlit keyboards — Ultrabook-like specs if ever we’ve heard them. Even the 15-inch model is missing an optical drive, and isn’t much larger than the last-gen Series 9. What separates them from your garden-variety $900 box, though, is a solid unibody aluminum design and a heartbreakingly beautiful display: a 1600 x 900 panel with a matte finish (!) and 400 nits of brightness. But is that worth shelling out an extra few Benjamins? We’ve just spent weeks playing with an early, pre-production version of the 13-inch model, and while we’re going to withhold final judgment until we review a production-grade system, we already have quite a bit to say about the design. So grab a warm beverage, settle into your comfiest chair and meet us past the break for an in-depth preview. Samsung unveils redesigned Series 9 laptops with 13- and 15-inch displays, starting at $1,499 originally appeared on Engadget on Mon, 09 Jan 2012 17:30:00 EDT. Please see our terms for use of feeds. 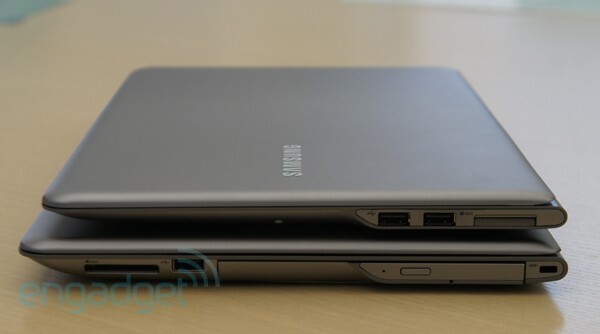 Depending on your point of view, Samsung was either late to the Ultrabook party, or perhaps just a bit early. Although the 2.8-pound Series 9 was a sight to behold when it first came out last year, it arrived shortly before Intel kicked off its Ultrabook campaign, and failed to match all of Chipzilla’s early-stage requirements. 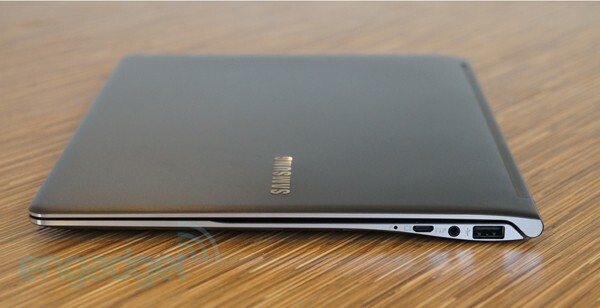 This year, Sammy’s back with a redesigned Series 9… along with two laptops it’s actually calling Ultrabooks. The notebooks, both of which fall under the company’s Series 5 line of products, include your requisite 13-incher, along with a larger 14-inch model with an optical drive. Both machines will have Core i5 processors, 4GB of RAM, eight-hour batteries and Intel integrated graphics, along with the same matte, 300-nit (1366 x 768) display that we loved so much in the Series 5 Chromebook. And though the 13-incher will have a 128GB SSD option, each comes standard with a standard 500GB 5,400RPM drive with 16GB of express cache for faster boot times and application-launching. You may recall this feature from the Series 7 Chronos laptop, except this time around, Sammy doubled the amount of flash memory paired with the HDD. Another thing the two systems have in common: they’re each denser than the early Ultrabooks we saw, with the 14-inch model coming in at 3.95 pounds, and the 13-incher tipping the scales at 3.5 pounds (a full fifth of a pound heavier than the HP Folio!). At least that girth comes with an unsparing port selection: Ethernet, HDMI, USB 3.0, two USB 2.0 sockets and an SD slot. And that’s just the 13-inch version: its big brother adds an optical drive, VGA output and a larger memory card reader. The pair will be available January 30th, starting at $899 for the 13-inch model and $949 for the 14-inch version. (The 13-inch configuration with the 128GB SSD will ring in at $1,099.) We expect to get our hands on final review units soon enough, but since we’ve already scored a few minutes of hands-on time, we’ve got photos and first impressions for you to peruse right this second. Samsung unveils 13- and 14-inch Series 5 Ultrabooks, starting at $899 (hands-on) originally appeared on Engadget on Mon, 09 Jan 2012 17:30:00 EDT. Please see our terms for use of feeds. This entry was posted on January 9, 2012, 5:39 pm and is filed under Mobility. You can follow any responses to this entry through RSS 2.0. Both comments and pings are currently closed.